In coming decades, climate change—and efforts to limit that change and adapt to it—will have increasingly important effects on the U.S. economy. These effects and their associated risks are relevant considerations for the Federal Reserve in fulfilling its mandate for macroeconomic and financial stability. Auffhammer, Maximilian. 2018. “Quantifying Economic Damages from Climate Change.”Journal of Economic Perspectives 32(4), pp. 33-52. Lane, Timothy. 2017. “Thermometer Rising—Climate Change and Canada’s Economic Future.”Speech to the Finance and Sustainability Initiative, Montréal, Québec, March 2. Olovsson, Conny. 2018. 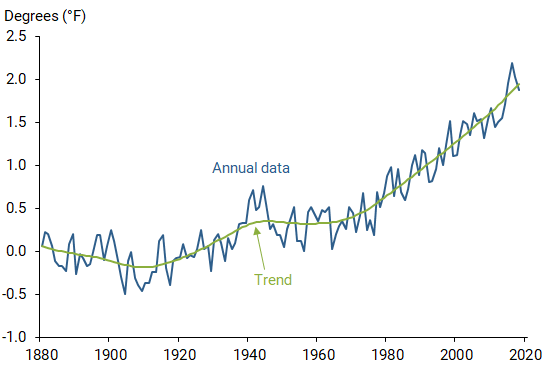 “Is Climate Change Relevant for Central Banks?” Sveriges RiksbankEconomic Commentaries 13 (November 14). Tvinnereim, Endre and Michael Mehling. 2018. “Carbon Pricing and Deep Decarbonisation.”Energy Policy 121, pp. 185-9, October.